The Otay Mesa Port of Entry was closed for roughly 15 minutes Wednesday night as Customs and Border Protection officers conducted a large-scale readiness exercise. 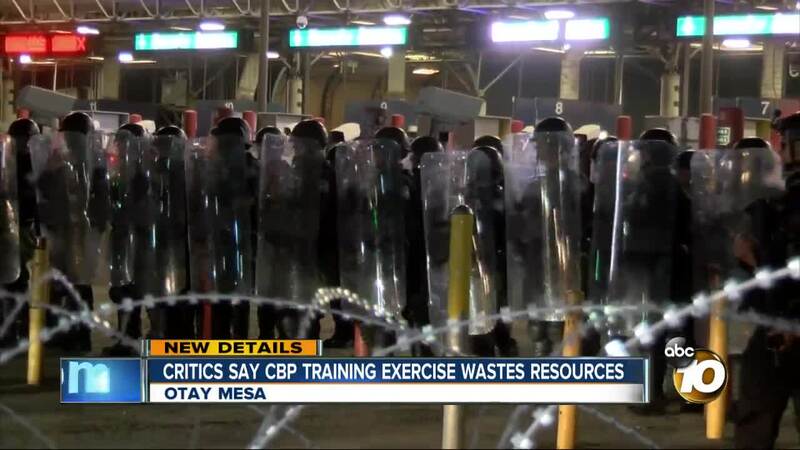 OTAY MESA, Calif. (KGTV) -- The Otay Mesa Port of Entry was closed for roughly 15 minutes Wednesday night as Customs and Border Protection officers conducted a large-scale readiness exercise. Officers were in full tactical gear during the exercise. During the training, they deployed flash bangs and smoke bombs while marching towards the Mexican side of the border. Despite being warned of the closure ahead of time, drivers stuck at the border appeared frustrated. They could be heard honking or seen turning back towards the United States instead of waiting for the lanes to reopen. Human rights activists tell 10News they see these exercises as a waste of money and resources. Pedro Rios, a human rights activist and program director for The American Friends Service Committee, says these exercises spread a false narrative and are used to spread fear. According to a CBP release, the exercise was to access the capabilities of their facilities and make necessary preparations that include operational readiness exercises. They say CBP's highest priority is the safety and security of the American people, the traveling public and CBP personnel. All traffic was back to normal just before 6:15 p.m.